Conclusive is a Certified & SBA Verified Provider. part of a longer term project to improve GAO products’ accessibility. Highlights of GAO-15-54, a report to congressional requesters. certifiers, WOSBs, and organizations that represent their interests. a requirement in the agency’s agreement with certifiers. monthly reports that third-party certifiers must submit. actual reasons for the high numbers of businesses found ineligible. contracts for which they are not eligible. EDWOSBs were eligible for a set-aside. generally agreed with GAO’s recommendations. information, contact William Shear at (202) 512-8678 or shearw@gao.gov. Women-owned businesses contribute significantly to the U.S. economy. men) adding roughly 500,000 jobs nationwide, according to the U.S.
procurement to women-owned small businesses (WOSB). opportunities available to WOSBs or EDWOSBs. (GSA); and interviewed selected WOSBs for perspectives on the program. EDWOSBs underrepresented, according to the program regulation. status as a WOSB or EDWOSB. certified by a third party, or self-certified by the business owner. free and businesses pay a fee for third-party certification. * Women’s Business Enterprise National Council. certification process in greater detail later in this report. Other characteristics: Fee waiver in select cases. part of a bundle including a Women’s Business Enterprise certification. Source: GAO analysis of third-party certifier documents. GAO-15-54. representations by businesses about their WOSB or EDWOSB eligibility. before submitting an offer on a WOSB or EDWOSB solicitation. WOSB whether or not the business uses a third-party certifier. Therefore, SBA considers this a self-certification program. certification method does not appear to influence contract awards. certification, and reporting to SBA on certifier activities. certifications were reasonable and affordable for a small business. WOSBs with which we spoke generally did not concur with this view. certification responsibilities to 14 regional partner organizations. information about WBENC’s oversight of its 14 partner organizations. entities to which it has delegated certification responsibilities. used to certify businesses as WOSBs and EDWOSBs. contact information for businesses that had applied for certification. certifiers did not include this information. certifiers collect and compile information transmitted to the agency. official used to assess the reports. contract was illegal and the business would be subject to prosecution. party certifiers and leaves concerns raised by certifiers unaddressed. SBA’s compliance guide for the WOSB program and its regulation. businesses, that question the eligibility of a business. federal contracting or criminal penalties, according to SBA officials. enforcement actions as part of the WOSB program. expected to evaluate the eligibility of businesses. response to the findings of its eligibility examinations. supported their attestations as required in program regulations. not have an estimation of completion. businesses on a given date after the business received a contract. whether contracts may have been awarded to ineligible businesses. ineligible businesses prior to a contract award. requirements–and not a basis for change in oversight procedures. to obtain meaningful insights into the program. SBA regarded the bid protest as means of identifying ineligibility. the quality of the pool of potential program award recipients. Administration (GSA) accounted for the majority of these obligations. the list of eligible industries for the set-aside program. a result of this change. year when most federal contracts are awarded. awarded to WOSBs from April 2011 through May 2014.
same four each year) did not meet their goal for either year. Source: SBA goaling reports (fiscal years 2011-2013). GAO-15-54. challenges and possible changes to increase program usage. this task was not required under other contracting programs. reluctance on the part of contracting officers to use the program. program prompted her to bid on set-asides under other NAICS codes. assurance that only eligible businesses participate in the program. oversight of the WOSB program. represented their eligibility to participate in the program. process of implementing many of our recommendations. U.S. Army and Defense Logistics Agency. For DHS, we selected the U.S.
which had received a set-aside contract. future plans to evaluate the program. promoting the program with WOSBs. eligibility to participate in the program. the report could be clearer about the program examination process. performance of reviews on an annual basis. Sandler, and Jena Sinkfield made key contributions to this report. industries in which WOSBs are substantially underrepresented. 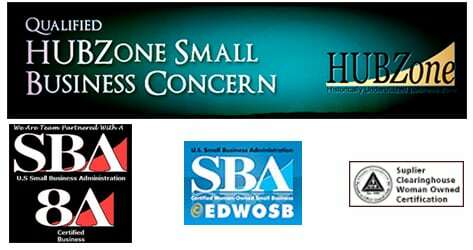 Women-Owned Small Business Federal Contract Program, 75 Fed. Reg. the Federal Acquisition Regulations on April 1, 2011. Businesses in Federal Contracting (Santa Monica, Calif.: 2007). set-aside, and some under the EDWOSB set-aside. Form 413) and a signed EDWOSB program certification. agreement, basic ordering agreement, or blanket purchase agreement. replaced the Central Contractor Registration database. attestation by the business of its program eligibility). eligibility to receive a WOSB program contract. 2014 data were not available at the time of our review. contracts and $4 million in the case of all other contracts. more socially and economically disadvantaged individuals who are U.S.
likely to compete for the contract. performed outside of the United States or its territories. are defined in 31 U.S.C. § 901(b). list of eligible NAICS was to conduct a new study. Visit GAO on the web at [hyperlink, http://www.gao.gov].